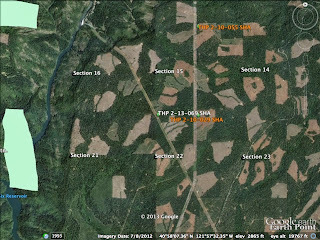 THPBlog: Roseburg Resources Company to clearcut near Big Bend, CA and the Pit River. Roseburg Resources Company to clearcut near Big Bend, CA and the Pit River. THP 2-13-069 SHA (Sweet Tea THP) Roseburg Resources Company, 393 acres; 95% clearcut, 5% selection, misc roadside logging. Little Roaring Creek, Bush Bar, Marble Creek (MD: T36N R1W Sec.14, 15, 16, 21, 22, 23). Winter operations, moderate erosion hazard, slopes up to 40%, 7 road drainage work sites, herbicides, impaired 303.d watershed, oversized units, kettle mountain roadless area, 3 spotted owls within 1.3mi, English peak greenbriar, scattered large trees. Estimated public comment deadline: 11/14/13. This THP is about 3 miles SW of Big Bend, CA and about 10 miles north of Montgomery Creek, CA and Highway 299. 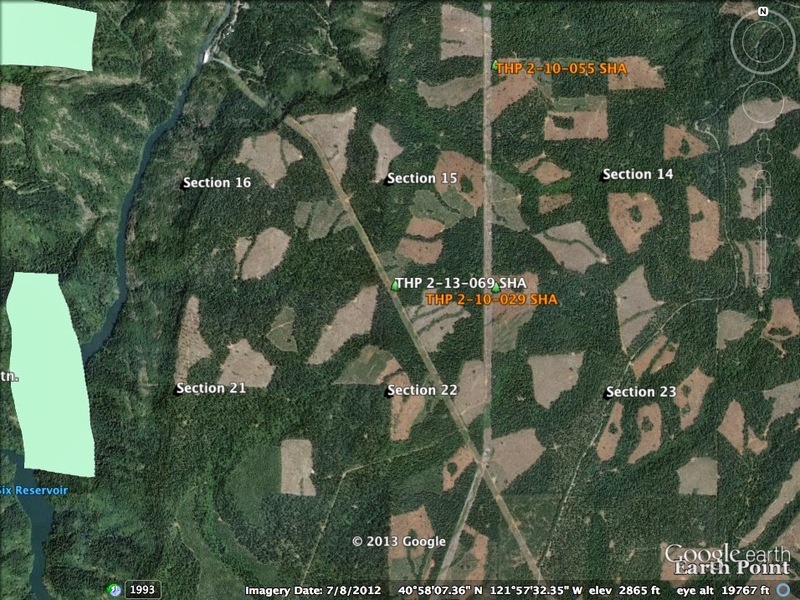 Roseburg Resources Company is planning a tractor based clearcut logging operation in mixed conifer stands at an elevation of 2,760 to 3,000 feet. The THP area flows into the Pit River, upstream from Shasta Lake which is listed as impaired for nutrients, dissolved oxygen, temperature and organic enrichment. Sections 16 and 21 are adjacent to the Kettle Mountain Roadless Area. Seven road drainage sites are planned for work including rocking, dip construction, culvert repair and replacement. English Peak Greenbriar was found in 21 locations within the THP area. More information is available on the THP Tracking Center website.